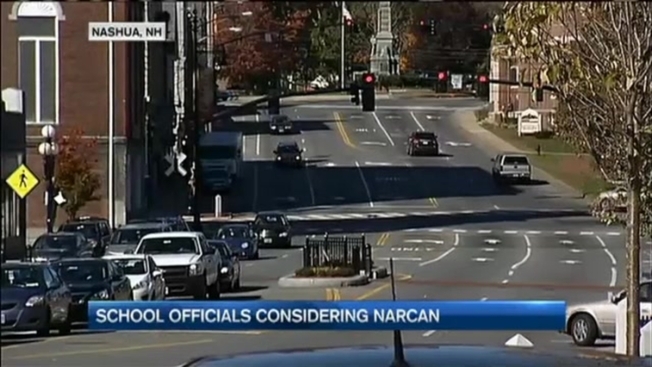 In Nashua, New Hampshire, a staggering and alarming 85 percent hike in drug overdoses in just the past year, and now school officials are worried the heroin epidemic will soon reach their classrooms. There have been 21 fatal overdoses in Nashua this year and now the Board of Education President George Farrington wants to see the life-saving drug Narcan available in schools. "I don't think we can turn our backs on it," Farrington said. He wants Narcan to be within reach for school nurses in case someone overdoses inside the building. "I don't want anyone in our district to be standing there waiting for first responders," he told necn Monday. City residents we spoke to understand the heroin epidemic and support Farrington's idea. "I would hate to see a kid lose his life because he overdosed so it's probably necessary," said Raymond Mancini of Nashua. Superintendent Mark Conrad is making it clear, there is no indication that any students are using heroin right now, but he says the way things are going in our communities, he agrees, it's better to be safe than sorry. "This is reaching a magnitude where we really need to get serious about providing resource to address it," Conrad said. Recently, police announced a drug sweep that netted 22 arrests in the city, proof that heroin is running rampant through Nashua neighborhoods. "I don't know why this is happening, it's really sad," said Nashua mom Denise Markert. And while it hasn't reached the classrooms, Farrington says it's the school's responsibility to be ready if it does. "It's proactive like defibrillators and epi-pens unfortunately, but that's the world we are in today," Farrington said. The superintendent says they still have several weeks of research before making a final decision on whether Narcan will be available inside schools. If they decide in favor of the idea, Farrington said it'd be paid for out of the district's operating budget and nurses would be properly trained on how and when to administer it.